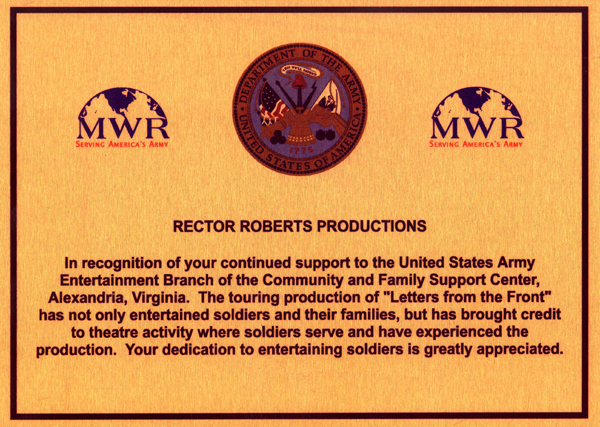 LETTERS FROM THE FRONT is a big Broadway-quality show. Touring it to bases from Tampa, FL to Anchorage, AK, from Heidelberg, Germany to Diego Garcia in the Indian Ocean is a costly operation involving months of preparation as well as cast and crew salaries; lights, sound, sets and costume expenses; transportation over land and in the air, and countless other logistical details. 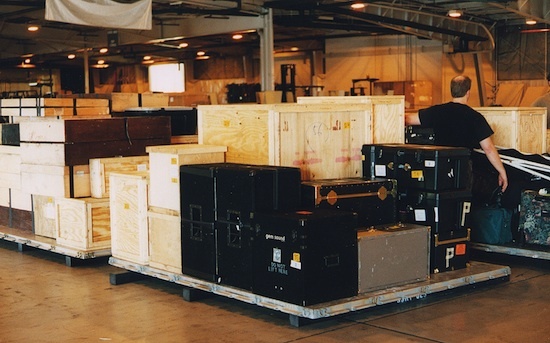 This is what our show looks like when it’s all packed up and ready to be loaded on a cargo plane to the next base. Why do we go to all this trouble? The men and women of the US military give us their very best effort 24/7/365. In return, we are determined to make our best effort for them. Nothing less will do. That includes paying for it without charging the military a single penny. How is this accomplished? LETTERS FROM THE FRONT is brought to military installations FREE OF CHARGE. 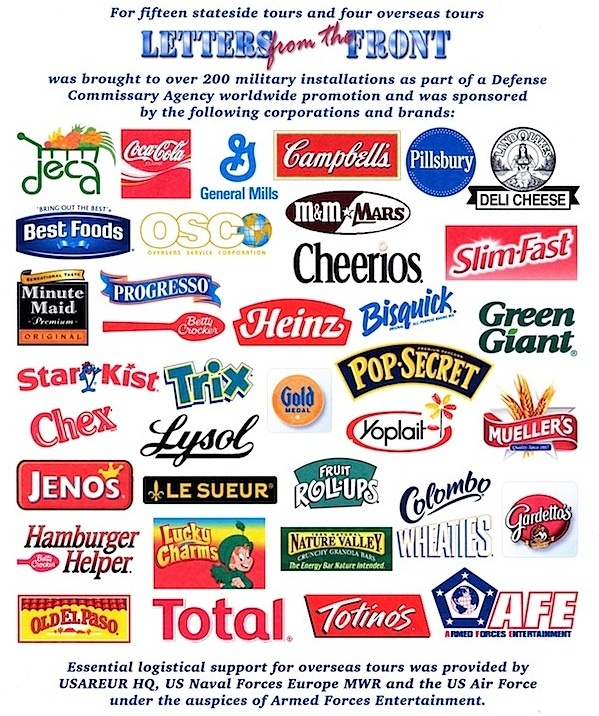 This has been made possible by the support of corporate sponsors who are committed to improving the quality of life for military personnel and their dependents on bases around the world under the auspices of the Defense Commissary Agency. 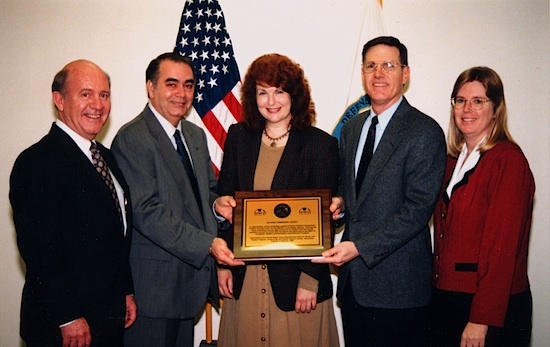 Gary Boyle of General Mills, Jerry Paquette of Army Family Support, MG Richard Beale Jr Director of the Defense Commissary Agency and Joyce Chandler of DeCA MBU present Producer Marsha Roberts with a plaque recognizing our efforts to support Army MWR (Moral Welfare & Recreation). In addition to performing in the show, our actors participate in Meet & Greets held at the base’s commissary. Not only do they get to say hello to military members and their families, they also autograph photos from the production. 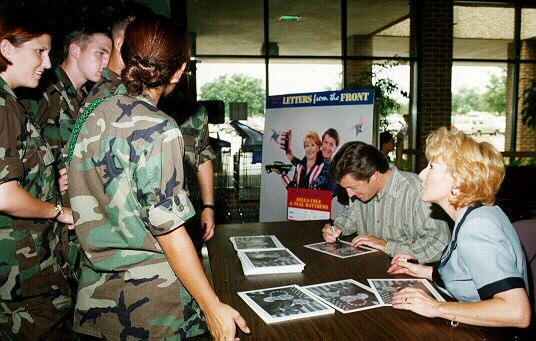 Letters From The Front stars Della Cole and Neal Matthews autograph pictures from the show at a base commissary. As we prepare to take LETTERS FROM THE FRONT back to military installations here and abroad we look forward to working with sponsors and supporters who are dedicated to improving the quality of life for those who serve, those who have served, and their families. Now more than ever we need to celebrate our military’s legacy of loyalty, duty, respect, selfless sacrifice, honor, integrity, and personal courage. Celebrating that legacy is what LETTERS FROM THE FRONT is all about. Always has been. Always will be. 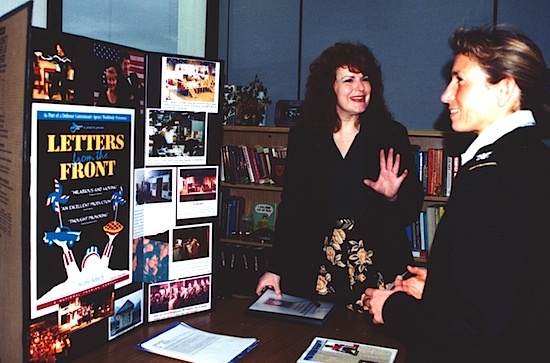 Producer Marsha Roberts is an untiring advocate for bringing LETTERS FROM THE FRONT to the troops.